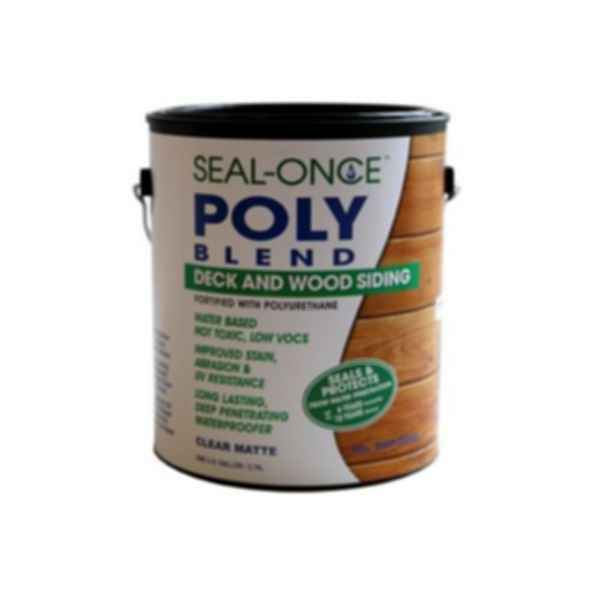 Seal-Once™ Poly Blend Nano Tech Eco Friendly Waterproofing Wood Protector is formulated with aliphatic polyurethane for exterior and interior surfaces to create Seal-Once Poly Blend. The combination of Seal-Once and Poly increases abrasion resistance and provides additional UV protection to the semi transparent stains. For exterior/interior use on all properly prepared, unsealed wood surfaces. Allow pressure treated lumber to age 3 to 6 months before application. The nano particles in seal-once penetrate through the blended product into the wood and waterproofs wood equally as well as applying the Seal-Once formula without the polyurethane. By adding the polyurethane to the Seal-Once, the stains performance improves as stated above. Helps prevent wood from cracking, splitting and warping. Apply Seal Ends Once to cut ends to further improve this function. Saves time and money. Protects vertical surfaces up to 10 years and horizontal surfaces up to 6 years from water penetration. New Image Coatings, LLC headquartered in Manchester, NH, is the manufacturer of the Seal-Once™ brand of non-toxic, eco-friendly Zero voc waterproofing sealers for all wood, composite decking and concrete and masonry surfaces. Seal-Once, a new class of waterproofer, outperforms all products on the market today. Seal-Once eliminates many health and safety hazards associated with current products. Seal-Once contains no solvents, petroleum distillates or other harmful chemicals. Seal-Once penetrates deeply into the wood, is UV stable, protects against mold and mildew stains, cracking, splitting and warping. Seal-Once will not harm fish, plants, pets or livestock as Seal-Once is not harmful to people or the environment. Once applied, Seal-Once can be stained or painted increasing the life of top coats. New Image Coatings guarantees the product for 6 years on horizontal surfaces and 10 years on vertical surfaces. Marine grade and industrial multi-surface formulas are also available. Semi-transparent tints are available with excellent UV protection. Seal-Once is endorsed by N.H. DES and is GreenSpec™ Listed. New Image Coatings, LLC. branded eco-friendly cleaners for wood and masonry complement the Seal-Once line of sealers. These cleaners are backed by a 100% Money-Back Warranty.